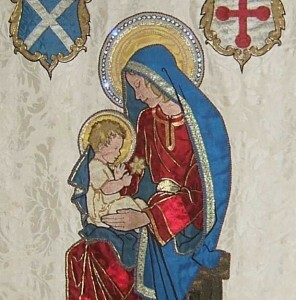 The 3rd Sunday Breakfast Service takes place in St Andrew’s again on 18 March: bacon baps and croissants at 10 followed by the short service for all ages at 10.30. A land of contrast and contradiction and blessing. Old stone, repurposed so many times; history sits in thick layers, yet the light over the water is unchanged, the green of spring just as fresh. Perhaps the old stones matter less than the living stones – those who we met, we who are changed. No wonder the Lord of all creation was raised in the beautiful land of Galilee, though amid so many human tensions, and chose the shores of the lake for so much of his ministry. hearing other groups around us with their chants and hymns, some very different from our sacred music. Jerusalem: beautiful in an unbeautiful way. Gethsemane: the feeling of Christ among the ancient olive trees. Tabgha: a moving, relevant, Eucharist over-looking the Sea of Galilee. Tiberias: saying prayers in the early morning on my balcony. As I read the phrase, ‘Christ as a light’, so the sun appeared over the hills opposite. What an amazing feeling and a great way to finish a wonderful pilgrimage. Inspiring, thoughtful, provoking, insightful….and just the start of our journey. And, his oft-repeated injunction to us in Arabic to walk ‘shway, shway’ (slowly, slowly), encouraging us to move more slowly through this world, lest we miss signs of God’s glory in beauty, creation and the faces of our neighbours. 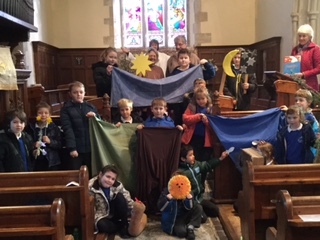 Children at Musbury School helped out in bringing to life the story of the Creation in the recent Open the Book session. On Tuesday 20th February at 10.30 the community cafe welcomes Sara Bennett from the Exeter-based charity Balloons to give a short talk about their work with bereaved families. The cafe will be open from 9.30-11.30 as usual with the usual delicious cakes and fresh coffee.